What a year 2013 was, especially for UK bingo sites. 2013 was the year online bingo went mainstream to the max, and nowadays, you can’t turn on the television without seeing an advert. No episode of Jeremy Kyle is complete without a DNA test, a punch up, and at least three adverts for the big budget brands such as Mecca Bingo, Gala Bingo, or standalone site Tombola. If you are the owner of a Smartphone or tablet computer then chances are you’ve already melted it playing mobile bingo – this was certainly the major technological advancement of the year, and although mobile bingo sites aren’t quite as functional as their online counterparts, roomies can still enjoy playing and chatting on the go…and walking into lampposts. After all, those sites can be seriously engrossing. So, let’s put our daubers down and take a look at some of the main bingo events of 2013. Bingo Godz arrived on a billowing cloud in autumn 2013, and immediately became one of the most innovative and exciting sites of all time, thanks to a unique social gaming aspect. There was no expense spared on the development of this site – players progress through six cosmic worlds, collecting magical Godz as they go. Deposit with £10, and play with £40. Practically everybody has a Smartphone nowadays, and bingo operators capitalised on this – now most bingo sites have a mobile version, allowing players to chat, win, and play where ever they are. Forget faffing around on Facebook, when you can banter with your buddies in a chat room – it adds a whole new dimension to social media, and a lucrative one at that. Mobile bingo is certainly gaining popularity with roomies – but if you must go mobile, make sure you look before you cross the road. There’s been a massive cash injection into online bingo, thanks to so many new players arriving at once. A 2013 survey revealed that 96% of regular players walk away with a decent prize, and some become instant millionaires. In 2008, at the birth of online bingo, a 53-year-old lady from Wales bagged a record-breaking £1.1 million jackpot. She was the first bingo millionaire, but it didn’t take long for her record to be smashed. Next month, another woman won £1.67 million. 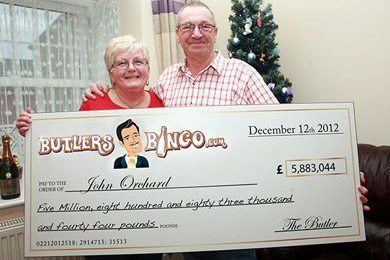 But it’s slots that create the biggest winners – John Orchard from Lincolnshire was playing the Dark Knight slot machine, and won close to £5.9 million with a 30p wager. Will you be the next multimillionaire? You won’t know until you buy a few cards and make a few spins at your favourite site. In slightly negative news, Gala Coral announced a downturn in profits, at least in its land-based clubs anyway. The dip in revenue was severe – the company announced a 6% drop in admissions. This is believed to be because of the recession, and more players staying at home to play online. What do Mel B, Simon Cowell, Reg Holdsworth and Ant and Dec have in common? No, they haven’t all slept with Sinitta – they’ve all partnered up with famous UK sites. At Gala Bingo, you’ll find a cast of Corrie characters popping up all over the show, and even a Corrie-themed room, where you can win a Golden Cobbles jackpot and watch vintage video clips. Online bingo may have been around for a few years, but 2014 promises to be its most successful year ever. Join the legions of new players and become a part of history. Failing that, you could always streak at a snooker final.